Aiseesoft iPad 2 Transfer is the best iPad 2 Manager which is able to help you export music, movies, camera roll, picture and camera shot from iPad 2 to Mac, and import local video, audio and image files to iPad 2 without any loss. Also it allows you to rip any DVD and convert popular video/audio files to iPad 2 compatible formats, and import them to iPad 2. Moreover, it is highly compatible with the latest iPhone 4S and iOS 5 now after upgraded. Transfer video/audio/photo files between iPad 2 and PC without losing anything. ...... iOS 5 now after upgraded. 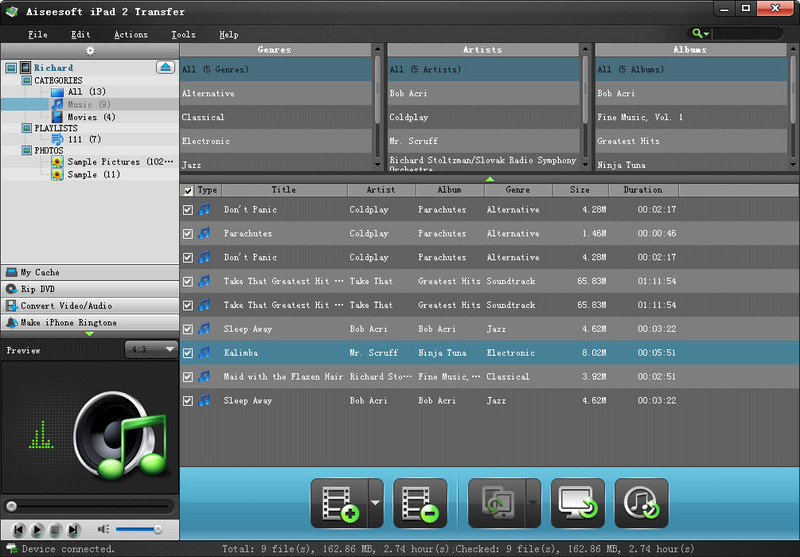 With this transfer, you can also transfer your iPad 2 files to other iPad, iPhone and iPod devices. The powerful video editing features allow users to customize output video effect, such as trimming video, cropping video frame, adding watermark, and so on. My Cache is used to store the converted files. And you can convert the BD/DVD/video to My Cache first and transfer them to your iPad 2 device later. You are able to convert your own DVD, video and audio files to iPhone M4R ringtone format. Once you connect your iPad 2 to computer and run this software, all information about your iPad 2, including picture, type, capacity, version number, serial number and format, etc., will be clearly shown on the main interface. Qweas is providing links to Aiseesoft iPad 2 Transfer 6.1.28 as a courtesy, and makes no representations regarding Aiseesoft iPad 2 Transfer or any other applications or any information related thereto. Any questions, complaints or claims regarding this application Aiseesoft iPad 2 Transfer 6.1.28 must be directed to the appropriate software vendor. You may click the publisher link of Aiseesoft iPad 2 Transfer on the top of this page to get more details about the vendor.